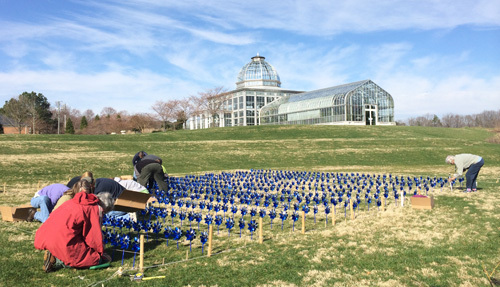 In recognition of Child Abuse Prevention Month, 3,000+ pinwheels will be “planted” in the Terrace Lawn (adjacent to the Cochrane Rose Garden). Thanks to Families Forward and Prevent Child Abuse Virginia for partnering with us on this project. A Million Blooms is the Garden’s celebration of spring. Events throughout the season include Spring Weekend with Peter Rabbit, Butterflies LIVE!, Mother’s Day, the Spring Plant Sale and plant shows, and activities in the Children’s Garden.